Basketball has never been hugely popular in Bangkok or Thailand, but nevertheless there are a fair amount of options for ballers and most schools here have a court or a hoop. Thai and Asian players often make handy guards due to their explosive speed and power, but their general lack of size means that westerners will usually have a big size and height advantage. That hasn’t stopped the Filipinos from making basketball their national sport though. The courts here tend to be mostly Thai with some westerners and Filipinos thrown in too. As usual, the Thais are a friendly bunch and will usually incorporate you into the game if you ask nicely. However, in some of the busy courts it can be hard to squeeze in so it’s best to make a team of 5 and then assert yourself onto the court when given an opportunity. Thais don’t like sunlight, so you’ll find that these courts are usually quiet in the daytime, busy in the evening when it gets cooler and darker. Here’s a pretty comprehensive list of basketball courts in Bangkok and what they’re like to play at. Click on the link for a Google map of how to get there. Nearest Skytrain and MRT stations are noted. Please let me know if there are any I’ve missed out. Probably the best located public court in Bangkok, this court is situated in the park right next to Emporium shopping centre (Phrom Phong BTS). The surface is not perfect but playable and the rings are good. It gets busy in the evenings so try and get there nice and early to establish yourself. One of my favourite courts in Bangkok. It’s a little out the way from the centre but easy to get to by MRT and BTS. There are two high standard courts that have games that go on into the evening. Courts are floodlit and there are also futsal and tennis courts in this great all-round area for sport. This is an indoor court that’s near the Lumphini MRT station. I haven’t played here much but they have games every evening and on the weekend too. A good quality court and I’ve been told a good standard of play. Sadly I’ve never been here but I’ve been told that it has one of the best basketball courts in Bangkok. Built by Red Bull (which is co-owned by a Thai), Red Bull X-Park is situated in the middle of Bangkok’s business district. This sports facility has two floodlit basketball courts that are open until late and a high standard of play. A little tricky to get too as there are no MRT or BTS stops nearby. There are 4 outdoor courts at the front of Huamark Stadium with welcoming Thais playing friendly games, and there’s a better court at ABAC university about 5 minutes walk away. There is also an indoor court inside Huamark Stadium but it’s not always available. 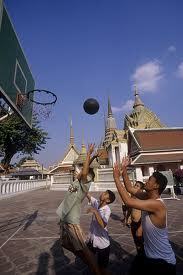 This park in the Phra Nakhon district of Bangkok has a public basketball court. I’ve not played here so I can’t comment on the standard. This park is miles away from the centre, but if you live in the Prawet area of Bangkok or nearby, this might be good for you. Kaset University in North Bangkok has some good basketball courts and the students and players here are happy to accommodate new players. I’ve not played at this court but I’ve been told that it’s located under a bridge on the Thonburi side of Sathorn pier, where the skytrain crosses the river. It is located directly left of the ferry station and is under a bridge so it’s good to play there all day. There are basketball or Takraw courts. If anyone has any more infomation about this one I’d love to hear it. Thailand’s biggest arena/concert venue has a lot of sports facilities nearby that include basketball courts. Again, a little out the way for most expats but if you’re in North Bangkok it might work for you. Almost all schools have a basketball court but they may not be cool with people just strolling in and shooting some hoops. Universities, on the other hand, should generally bit more welcome. Just get chatting to some sporty looking students. An ex-NBA basketball player who now runs a basketball academy at many of Bangkok’s international schools has set up the city’s first true expat basketball league, the only one previous was a Filipino league that didn’t have many foreigners. The league is played at NIST on Sukhumvit 15 on Sundays and follows an NBA-style league then playoff format. There are some very competitive players in the league but it’s good-natured overall. Their new season should be starting soon so get in touch! When I first moved here it took me ages to find a game, so I hope this guide to basketball in Bangkok helps you get a game in the city. Let me know if there are any great courts I’ve missed out on! If you’d like to improve your sports conditioning, check out our range of group classes at BASE. 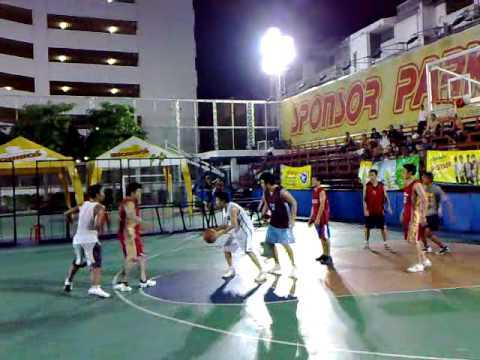 This entry was posted in Bangkok Specific and tagged Bangkok, Basketball, Leagues, Outdoor, Sport, Sukhumvit by jackthomas. Bookmark the permalink. Nice, a comprehensive article like this has been long overdue. However I’ve never seen an indoor bball court at Lumpini Park… There’s the outdoor one to the east of the park that’s busy every night under the lights and another sort of hidden one that you need to be a member to get into, next to the new fitness complex/swimming pool. I go to Lumpini almost everyday — have I really missed an indoor court all this time??? I think so David. It’s been a while since I’ve been there (years, in fact!). Check it out and let me know.